If you are considering investing in a shade solution for your home or business, you should consider tension membranes. While shade sails, awnings and canopies are also excellent shade solutions, tension membranes are more suitable to some particular applications. But before you start looking for tension membranes on the Gold Coast, you should know a little more about them. And, as the owner of Global Shade – Australia’s leading shade solution provider, I’ll know just about everything there is to know about them. So, continue reading this post to discover everything you need to know about tension membranes. When you’re done reading through, you’ll know exactly what to look for when making a purchase. A tension membrane is a special shade solution which consists of a shade fabric supported by structural beams. Unlike most other shade solutions where the fabric is fixed to structural elements, in a tension membrane the structural elements can be compressed or bent. This gives a tension membrane structure a sleek design and it can be manufactured in almost any shape and form. While tension membranes are obviously great at as a shade solution, they offer several benefits. First of all, a tension membrane can be designed in modern shapes and this makes it highly visually appealing. Also, tension membranes can be designed to span large areas which is usually not possible with other shade solutions. A tension membrane also transmits more light than other shade solutions and can be made reflective or waterproof as well. They can also include blinds to create fully enclosed areas. As such, they are great for providing all-weather protection to large areas. And, despite offering all these benefits, tension membranes are actually more cost-effective than permanent shade structures. This is one big reason why they are just so popular here in Australia. Tension membranes are available in many different types depending on the shade fabric used. The most common types of shade fabrics used in tension membranes include PTFE Fiberglass, PVC, ETFE Film, ePTFE and Insulated Tension Membrane. Here, at Global Shade, we make use of top-grade PVC shade fabrics in our tension membranes. A tension membrane is suitable for use in a variety of domestic and commercial applications. Thanks to them being available in different shapes, styles and their large coverage, they are great for use in car parks, patios, courtyards, verandas, walkways, restaurants, hotels, cafes, pubs and several other applications. Now that you know more about tension membranes, you can go out and make a purchase. For this, look no further than the experts here at Global Shade. 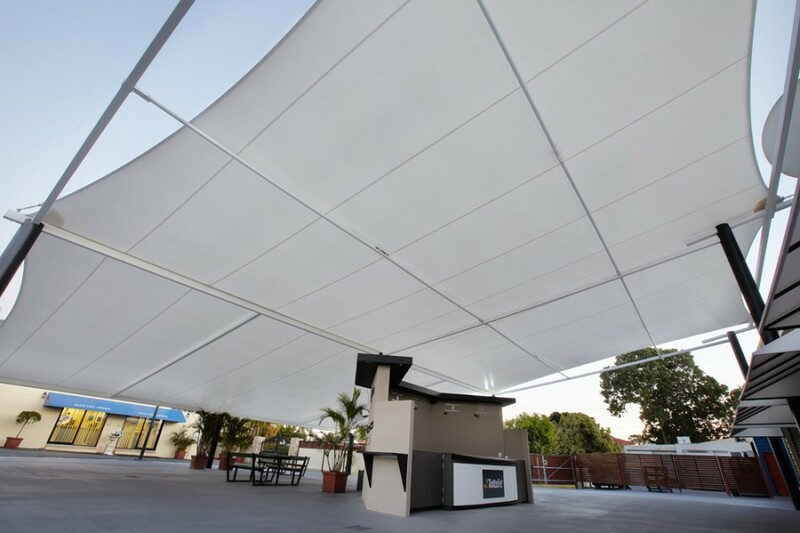 We’ve been providing high quality shade solutions including tension membranes here in Australia for more than 25 years now. We ensure that our shade products are manufactured to the best of standards and meet all Australian safety and building requirements. Furthermore, we can even customise our tension membranes in any design or style for you. With us, you can even choose from a range of designer colours and even include your branding in your tension membrane. Tension membranes are an extremely popular shade solution which consist of a shade fabric attached to structural elements which bend or compress. This special design allows tension membranes to cover large areas without compromising on cost. A tension membrane can be manufactured in any design, it naturally transmits lights and can even be paired with blinds to provide all-weather protection. Tension membranes are available in many types, depending on the shade fabric material. They are suitable for use in a variety of commercial and domestic applications. And, for the best tension membranes on the Gold Coast, consider us at Global Shade. To find out more about our tension membranes, contact us today!